Get That Winner Smile With Invisalign! They say that having a good smile makes your confidence better. We could all use some help to get that perfect smile by letting your straighten your teeth in no time. Gone are the years that there was only one option for straightening teeth, but now because of the technological advances it now gives us new options. Heard about clear braces? 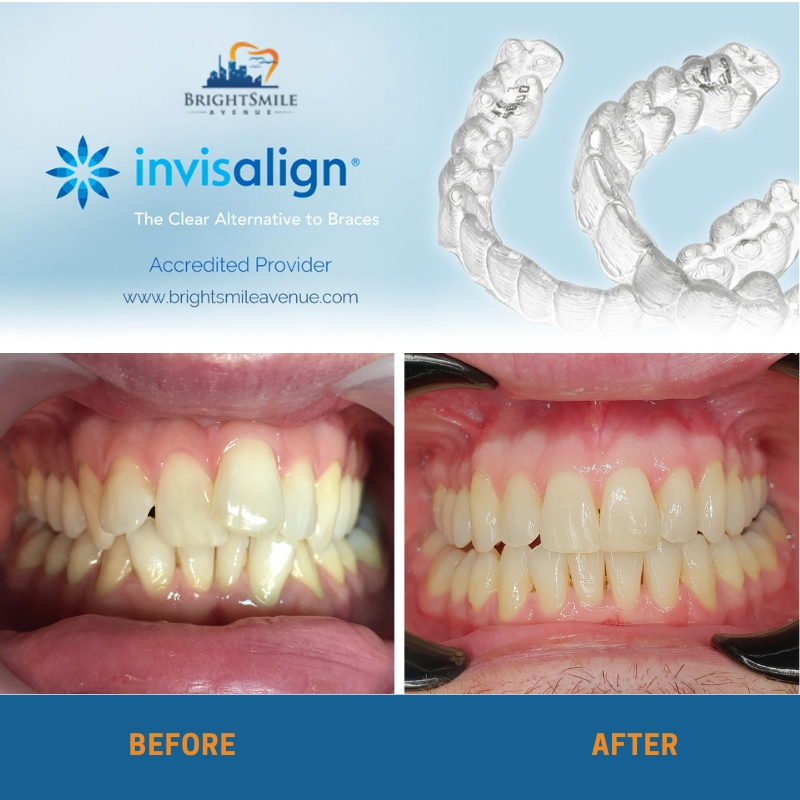 Invisalign is the newest technology for moving teeth. Traditional Braces are still an option but some don’t want to have it anymore are we right?… since it has a lot of disadvantages. Like for example, braces use metal or ceramic brackets that are connected to one another thru wires. These wires move teeth slowly overtime by pulling teeth into a new direction. These brackets are considered natural food traps, as your dentist might say. They often come off when you bite onto something hard and chewy. So it may take a little longer for your teeth to move because one of the brackets might have fallen off or you might have lost it while you were eating. Orthodontic aligners, like Invisalign are the newest contribution in aligning teeth. They are form fitting custom-made retainers that slowly change the tooth’s position over time. They move the teeth in a similar way to how braces work however Invisalign is conveniently removable and transparent making them virtually invisible. They do what braces do without the restrictions. Invisalign® is custom-made for your teeth so you do not need wires and brackets. Little by little, your teeth shifts into place , creating that winning smile at the very end. Aside from being invisible and it’s convenience when wearing the tray, there are many other reasons to choose Invisalign. Here are the top 10 most important reasons to use Invisalign. Invisalign is as effective as traditional braces. Under bites, overbite, overcrowding and gaps between teeth can all be addressed by Invisalign. Traditional braces sometimes cause insecurities. Nobody would want a metal mouth. Invisalign is a solution which can often uplift your confidence since they clear and unnoticeable. There are many things you should not and cannot eat while wearing braces (traditional). Like popcorn, apples, corn on the cob, raw carrots, chewy food, caramel candies and a lot more. Invisalign removes these restrictions because you can take it out when you eat. Plain and simple. Invisalign takes between 10 and 24 weeks depending on the teeth need to be moved or rotated. Visits to the dentist are less and treatment time are a lot shorter. After the first visit you drop into your dentist’s office once every 6 weeks and get a new pair of aligners. Many dentists or orthodontists offer monthly payments to make payments convenient and affordable. This is a major reason people choose Invisalign over traditional braces. Invisalign is not noticeable. Wearing them while at or participating in sporting activities can give your teeth more protection. Using Invisalign as a protection for the teeth while playing sports is also effective. You can use your tray as a mouth guard protecting your teeth from grinding while you sleep. Since each and every aligner are removable, it makes brushing and flossing very easy. This helps promote good oral health. No mouth sores at all compared to those wearing traditional braces. No wires sticking on the cheek area as well. Wearing your tray while working can also help you stop grinding since it is considered a protective layer in between your teeth. Orthodontics was invented to help improve health, function and esthetics. So here’s a tip: Always Remember you will be able to achieve these three with Invisalign®. We’d love to answer all your questions about Invisalign®. Please call us at 6212556 or email us to see if Invisalign is right one for you. Our BrightSmile Avenue team will walk you through the procedure and even invite you in for a free consultation.